Fashion doyennes, call your travel agent and cancel those trips to the Coasts. Cincinnati has a new style mecca in town, and there's no need to jet set to NYC, LA, CHI or any other city with style. Nordstrom flung open its doors Friday morning with much fanfare, including an early bird cosmetics blitz and special trunk shows showing off the latest creations from the world's top designers. I was lucky enough to get a sneak peek of the new digs at Kenwood Towne Centre Wednesday evening at the Opening Gala - billed as a chance to sip champagne, nibble delicious bites and peruse the racks while raising money for several local charities. GOP Big Wig joined me for the excursion - she is likely my best dressed and most fashionable friend, and I knew her familiarity with some of the more tony clothing lines would serve me well. We stepped in the store and were immediately greeted by a fleet of Nordstrom employees, all offering smiles, kind words and satin sachets to be filled with cosmetics samples - this first impression would set the tone for the rest of the evening, and my general opinion of the top notch department store. As much as my heart, no, my eternal being coveted this stiletto, my paycheck, bank account and pressing financial obligations said no, NO, NO! 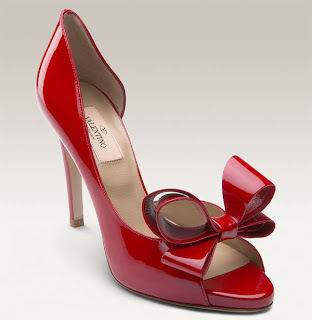 One pair carries a $695 price tag, meaning my tootsies will have to love longingly from afar. Thankfully, Nordstrom (and by the way, perhaps now is the time to mention the department store does not spell its name with an 'S' at the end. It is Nordstrom. Not Nordstroms - much like the whole Kroger/Krogers Meijer/Meijers Wal-Mart/Wal-Marts yes people really say that debate) carries more affordable shoe lines. The BP. SHOES collection offers more affordable brands (Steve Madden, Jessica Simpson, Naughty Monkey e.g.) that can hit a sweet spot price point - especially when they're on sale. After cruising through and drooling on the shoes, we headed to cosmetics and fragrances. This is where we were bombarded by customer service. I know it was the opening gala and all hands were on deck, but we were incredibly impressed by the amount of attention we received by the people staffing the many makeup and fragrance counters. GOP and I both agreed, we felt like celebrities thanks to all the fawning at Chanel, Trish McAvoy, Dior, Kiehl's and other counters. Everywhere we turned, we were offered fragrance and cosmetic samples and complimentary applications. I hope Nordstrom maintains that kind of generosity well after the opening. Most women I know are hesitant to invest a significant amount of money in cosmetics without an opportunity to "try before you buy." An inexpensive mascara tube from the drug store is a cheap way to try something out, but I am less likely to spend $30 on the latest formula/wand/you-name-it without getting a chance to test drive it. Thankfully, the makeup artists at Nordstrom are quick to help out a gal. After we got our faces appropriately pancaked and our little satin sachets full of of scents and foundation, we headed upstairs to scout out the clothing. Unfortunately, my video camera battery died just as I started shooting the live models, but this quick (and I mean quick) video gives you a good sense of the vibe. GOP and I headed to the denim section, and she was immediately impressed by the brands available. Hudson, True Religion, Citizens of Humanity, 7 For All Mankind (snarky note #2: friends, the "Seven" jeans at Lane Bryant are NOT the same line as 7 For All Mankind), Rich & Skinny, Rock & Republic - we were rather impressed by the variety of exceptional, first class brands available at Nordstrom. Next time you drop a dime (or two) on designer jeans, you might want to consider PRVCY, or Privacy For The People. PRVCY was started by a woman whose mother died of breast cancer. Apparently Carolyn Jones was displeased by the breezy immodesty of the back of her mother's hospital gown. She named her brand to honor the privacy owed to the wearers of her jeans. One of the Nordstrom managers told us every sale helps promote breast cancer awareness and donates money to support free mammography screenings to women across the country. Enough about the fancy pants denim. From start to finish - my friend and I were impressed with the personnel and products at Nordstrom. Even when we told the salespeople we were just browsing, they kindly offered assistance and information about their wares. In the current economic climate, customer service will be the factor that makes or breaks a retailer. With a history reaching as far back as the beginning of the 20th century, Nordstrom is in no danger of closing its doors. But with a reputation of exceptional customer service, it's certain Nordstrom will celebrate many successes in Cincinnati for years to come.